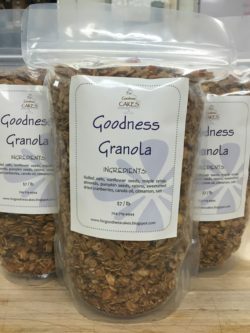 It’s healthy and delicious, and people can’t get enough of our homemade Goodness Granola! This yummy concoction of oats and nuts is the perfect “pick-me-up” and makes a great gift. Come by for a free sample or call to place an order! Sold by weight in any amount.